The Hyperstrada goes that extra mile to deliver long distance adventure and enable practical, everyday motorcycling in absolute Ducati style. Brand new from the ground up, the Ducati introduces the new 110hp Ducati 821cc Testastretta 11° engine in a new Trellis frame equipped with top-of-the range chassis components. The Hyperstrada model represents a completely new dimension for Hypermotard, with the innovative realisation of a unique “cross-over” between the worlds of motard and touring. This incredibly versatile motorcycle opens an exciting new road to explore and releases the full potential of this thrilling family. Its factory-equipped touring components present a comfortable and user-friendly travel companion with generous luggage capacity. The added security of ABS and DTC is combined into the Ducati Safety Pack and fully integrated into the Sport (110hp — High), Touring (110hp — Medium) and Urban (75hp — Low) riding Modes. In preparing the new model for the open road, Ducati fitted a strong, lightweight and elegantly styled 50 litres of quickly-detachable side-luggage —offering an extra 31 litre top case as an accessory – and a centre stand for stable parking when fully loaded. With handlebars raised by 20mm (0.78in), a touring screen provides improved wind protection and, with long journey comfort in mind, a special wider touring seat is fitted with thicker foam cushioning for both the rider and passenger and confidence-inspiring passenger grab-handles. Extended mudguards, a sump guard and two auxiliary 12v power outlets, intended to feed accessories such as heated clothing, complete the enhanced specification. The Hyperstrada is also offered in “low version” with shorter suspension front and rear providing a lower seat height of 830mm (32.7in). The version includes shorter side and centre stands and considerably enhances sure-footed confidence, especially when combined with the accessory low saddle to achieve a total reduction of 40mm for an 810mm (31.9in) seat height. The front suspension of the Hyperstrada uses 43mm Kayaba upside-down forks with 150mm (5.9in) of wheel travel and the rear suspension uses a single Sachs rear shock absorber providing 150mm (5.9in) of rear wheel travel with rebound damping and user-friendly remote hydraulic spring preload adjustment. Both the front and rear wheel travel of the low version Hyperstrada is reduced by 20mm (0.79in). The full touring trim tips the scales with a dry weight of 181kg (399lb) and rides on the Multistrada’s Pirelli Scorpion Trail tyres, mounted on 10-spoke, 1199 Panigale-style cast aluminium wheels. The Hyperstrada is finished in Ducati red or a sophisticated arctic white against subtle racing grey Trellis frame and black wheels and has side luggage in textured black with polished stainless steel “Ducati” name plates. The Hypermotard prototype was an instant success when first shown in 2005 and soon became a top seller when its production started in 2007. Since then, its unique design has excited riders around the world and praise for this thrilling and versatile model has never stopped — and neither has its development. 2013 sees the introduction of the next generation design, embracing the original “thrill bike” character and enhancing its adventurous dirtbike-inspired look with visibly high ground-clearance, sharp and high tail-piece and narrow waistline – design elements that characterise this type of motorcycle whether used for the daily commute or touring. Attention to the detail of flowing lines has resulted in maintaining the essential, minimalist image of the family, even with the complexity of packaging a liquid-cooled engine. Proportion, ergonomics and practicality shaped this new generation of Hypermotard and the integration of Ducati’s latest technologies, such as second generation Testastretta 11° engine, Ducati Safety Pack and Riding Modes, underlines its absolute Ducati character. The Hyperstrada has a new 34mm diameter tubular steel Trellis frame with 25.5° of rake and trail and offset of 104mm (4.1in) and 30mm (1.2) respectively, providing a sure-footed, stable “feel” without compromising the Hypermotard’s original agility. The frame marries to a die-cast sub-frame and incorporates a Multistrada-like techno-polymer mid-section as part of the assembly. The Hyperstrada retains its highly manoeuvrable 70° of lock-to-lock steering movement, while the wheelbase now increases to 1490mm (58.6in), further enhancing the model’s stability at speed and providing ample area for rider, passenger and luggage. The totally revised fuel tank has increased capacity by 3.6 litre (0.9 US gal) to 16 litres (4.2 US gal), improving the overall autonomy of the Hyperstrada while maintaining its thin waistline and compact silhouette. The Hyperstrada’s compact instrumentation console has been designed with warning lights across the upper section, which illuminate for neutral, turn signals, high-beam, rev-limit, oil pressure and fuel reserve and an LCD screen with dot matrix area below for all other information. The screen presents data for speed, rpm, total mileage, trip1/trip2, engine coolant temperature and ambient air temperature and time. Additionally, the display also presents current fuel consumption, average fuel consumption, average speed, and journey time. The display constantly shows the selected Riding Mode, including the associated ABS and DTC levels. All three Riding Modes can be easily changed, while stationary or in motion, by simply scrolling through the displayed modes using the indicator cancel button. When stationary, buttons on the left-hand switchgear can be used to enter a setting menu from which adjustments to the various functions can be made including personalised ABS (1-2+OFF), DTC (1-8+OFF) and power delivery via Ride-by-Wire (Low-Medium-High). All settings are saveable in the instrumentation’s memory and can easily be returned to factory settings with a simple default function. The instrumentation is also system-ready to accept the heated grips Ducati accessory, which then produces its own control menu, selectable by scrolling through with the engine starter button. The headlamp uses a very compact and lightweight assembly, which employs a single parabola for high and low beam functions using a blue vision bulb and LED positioning light. For the rear, a specially designed strip of LEDs, enhanced by a high diffusion lens shaped into the sleek lines of the tailpiece, acts as both rear light and brake lights. Front directional indicators are stylishly integrated into the handguards, keeping the lines of the Hyperstrada as clean as possible and a hazard light function is also also available, activated by holding the left-turn signal button on for four seconds. The Hyperstrada’s full Ride-by-Wire introduces a new and compact electronic twist-grip, perfectly matching the minimalist styling of the model’s slim-line switch bodies. They house easy-to-use switches and buttons, and feature a unique weapons-like ‘trigger catch’ that slides down to cover the starter button when the kill-switch is activated. A conventional control cable actuates the clutch and a 4-point adjustable lever for the front brake enables full personalisation. Black finished footpeg supports are formed in high pressure die-cast aluminium with integrated heel guards and feature rear brake and gear shift pedals in forged aluminium. 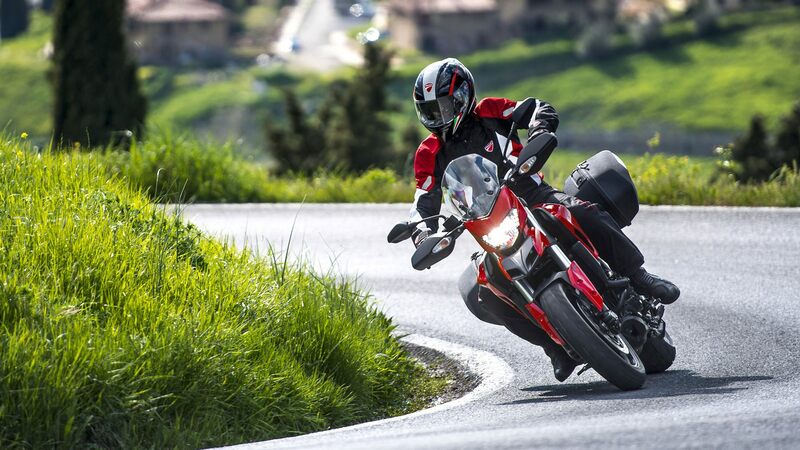 Ducati’s Riding Mode technology, incorporates 2-level ABS and 8-level DTC to introduce the Ducati Safety Pack (DSP) concept to the Hyperstrada, further underlining the focus on performance safety. Ducati’s industry-changing Riding Modes effectively offer optimised settings appropriate to rider and environment by selecting from a choice of three pre-set modes according to model. Each Riding Mode is pre-programmed to instantly change engine character, ABS and DTC intervention – even while riding. The modes are made possible by combining a number of class-leading technologies. An electronic Ride-by-Wire (RbW) system administers different mappings to regulate power delivery, while the Ducati Traction Control system (DTC) uses eight levels of system interaction to enhance control by reducing rear wheel-spin and the ABS processor provides two pre-programmed levels of anti-lock braking. The Sport Riding Mode provides 110hp, delivered with a “High” RbW throttle response, level-3 DTC system intervention and level-1 ABS of sport-oriented braking performance with reduced rear-end lift-up prevention. The Touring Riding Mode provides 110hp, delivered with a “Medium” RbW throttle response, level-4 DTC system intervention and level-2 ABS with maximum safety and braking stability and increased rear-end lift-up prevention. The Urban Riding Mode provides 75hp, delivered with a “Low” RbW throttle response, level-6 DTC system intervention and level-2 ABS with maximum safety and braking stability and increased rear-end lift-up prevention. The Ride-by-Wire (RbW) system is an electronic interface between the twistgrip and the engine which decides the ideal power response depending on the Riding Mode selected and according to the rider’s throttle input. The twistgrip no longer uses a throttle cable to control the throttle body butterflies, but instead delivers a signal to a control unit, which in turn operates the butterfly opening. The RbW system enables the use of three different mappings to regulate the power delivery. The three maps offer 110hp with a “high” sports-type delivery, 110hp with a “medium” progressive delivery suitable for touring and 75hp with a “low” reduced delivery for city or rain use. The Ducati Traction Control is an intelligent system which acts as a filter between the rider’s right hand and the rear tyre. Within milliseconds, DTC is able to detect and then control rear wheel-spin, considerably increasing the bike’s active safety and performance, an important component of the Ducati Safety Pack (DSP). The new Hyperstrada uses the very latest DTC software, now optimised with seamless intervention to ignition timing only. Included as an integral part of the Ducati Safety Pack (DSP), the 2013 Hyperstrada is fully equipped with the Bosch ABS 9MP controlled Brembo braking system, an impressive combination of state-of-the-art security and proven performance. Shorter stopping distances with enhanced stability are vital prerequisites for all motorcycles, but adding full Riding Mode interaction takes the Hyperstrada’s braking to the next level. From the 2-level programmed system, level-1 provides a sport-oriented ABS interaction with reduced rear-end lift-up prevention, while Level-2 delivers maximum safety ABS interaction with enhanced stability and increased rear-end lift-up prevention. The front brakes use twin radially-mounted Brembo, four piston, Monobloc M4-32 callipers actuated by a master cylinder with a 4-point adjustable lever. The fronts grip 320mm discs, while a single 245mm disc on the rear is gripped by a single Brembo calliper. Typical of all Ducatis, these components ensure high performance braking and set the standard in this segment. The Bosch-Brembo ABS system is fitted as standard equipment, delivering outstanding braking performances in all conditions and providing a major contribution towards performance safety. An option to disable the ABS in each individual Riding Mode is available via the instrumentation, and the system allows the setting to be saved and memorised at the next ignition-on. When developing the new power unit for the next generation Hypermotard family, engineers analysed capacity and bore/stroke ratio to create the optimum combination of tractability and Hyper performance. The 821cc Testastretta 11° engine introduces an ideal, all-round performance-producing 110hp (80.9kW) @ 9,250rpm with a wide and ride-enhancing 65.8lb-ft (9.1kgm) of torque @ 7,750rpm that underlines its pure Ducati character. The four valves per cylinder, liquid-cooled engine has a compression ratio of 12.8:1 and measures 821cc from an 88mm x 67.5mm bore and stroke, which provides a wide range of torque and an impressive and practical peak horse power value. The engine, which is cooled by a high efficiency radiator mounted with twin electric fans, breathes through two 52mm, full Ride-by-Wire throttle bodies which provides three different engine “characters” within the Riding Modes. The new 821cc Testastretta 11° adopts a number of operation-enhancing features introduced in the second generation Testastretta 11° DS used in the 2013 Multistrada, including repositioned fuel injector spray targets and a secondary air system. The system enables a smoother cycle-to-cycle engine operation with increased fuelling during specific engine operations. This optimisation of fuel-mapping without compromising emissions is achieved by completing the oxidisation of unburned hydrocarbons, which reduces HC and CO levels. The system is activated when the engine ECU recognises specific conditions in the engine’s operation via the lambda and throttle opening sensors. It then opens a valve enabling a flow of clean air from the main airbox to a reed valve situated in each cylinder head, enabling one-way flow into an air gallery exiting into the exhaust port close to the exhaust valve. Entering the hottest point of the exhaust gasses, the fresh charge of air enhances the burn environment, eliminating any unburned fuel in the exhaust cycle. For increased user-friendliness, Engineers reduced the amount of valve over-lap from around 40° – typical in performance engines that operate constantly at high RPM – to just 11°. This reduces peak horse-power slightly, but enhances mid-range and overall smoothness – perfect prerequisites for the extreme versatility of the new Hyperstrada. The overlap angle is defined as the interval of crankshaft rotation, measured in degrees, during which both the intake and exhaust valves are open at the same time. This overlap occurs between the end of the exhaust stroke and the start of the intake stroke. On the Testastretta 11° engine, this angle has been reduced and the fresh inlet flow less compromised by the exhaust gases, resulting in much smoother combustion, improved fuel economy and lower exhaust emissions. Unburnt hydrocarbon emissions (pre-catalyser) and specific fuel consumption (and consequent CO2 emissions) are considerably reduced. The new engine is equipped with an APTC, oil bath clutch with ‘slipper’ function and light feel at the lever. Its design uses a progressive self-servo mechanism that presses the plates together when under drive from the engine, enabling the reduction of the clutch spring rates. Now further simplified with the use of a control cable actuation, it achieves an even lighter clutch lever at the handlebar, ideal in stop-start traffic or long journeys. When the drive force is reversed (over-run), the same mechanism reduces the pressure on the clutch plates, enabling them to provide a race-like ‘slipper’ action, which reduces the destabilizing effect of the rear-end under aggressive down-shifting and provides a much smoother feeling when closing the throttle or down-shifting under normal riding conditions. The completely new 2-1 exhaust system runs through 50mm headers, and is controlled by an exhaust valve before passing into the new single silencer, black finished with a polished stainless steel end-cap. The system uses new sound-absorbing technology to achieve such a compact layout and is completed with catalytic converter and two lambda probes for optimum Euro 3 emissions management. The 821cc Testastretta 11° engine reaches another milestone in Ducati’s constant investment in quality by enabling the distance between major service intervals (valve clearance check) to be set at an owner-friendly 30,000 kilometres (18,641 miles). Engine Type: Testastretta 11°, 4-valve-per-cylinder Desmodromic, liquid cooled. Exhaust: Lightweight 2-1 system with catalytic converter with twin lambda probes. Additional equipment: Touring screen, touring seat, Passenger grab-handles, 2 x auxiliary power outlets, side luggage, centre stand, engine sump guard, extended front and rear mudguards.